In the run-up to Christmas, the shops are stuffed to bursting with stuff to buy to give. Take an ordinary object and wrap it up in festive paper, ribbons and bows, and you have transformed a thing into an idea, an object into a symbol. Under the Roy Christmas tree, the packages tend to be about the thickness and weight of a book. That’s because they usually are. From board books for toddlers to gardening books for totterers, a quarter of all bookshop sales happen in the one month leading up to Christmas. ‘Books are for giving’ is not just a great advertising slogan, it’s an economic fact. Despite the prevalence of eReaders, the convenience of downloadable books, and our increasing comfort with reading on screen, let’s face it, an ebook makes a crap gift. Half the point of the whole process is the handing over, the struggling with sellotape, the reading of the little gift-tag, the whole unwrapping thing where your character is laid bare: picky paper-saver or a flamboyant tearer. Walking around Waterstones this year, it looks like the response by publishers to the gauntlet thrown down by ebooks: You want physical? Let’s get physical then. Stroke this. At bookshop entrance, one table is piled high with a large format, gorgeously arty children’s book: a perfect Christmas gift, with a seasonally festive feel to it, called The Fox and the Star. The stylized illustrations look like lino- or wood-cuts, and screenprinted using just one or two colours. It is a fable – few words per page, each spread an artwork in itself, and hardbound in rich navy-blue cloth binding with silver ink highlights. The book was written, illustrated, typeset and created by Coralie Bickford-Smith – who just happens to be the cover designer at Penguin responsible for the Clothbound Classics too. The trend, started a few years ago, to include information on the typeface and paper at the back of the book was I suspect all part of this desire on the part of publishers to feed the need of the physical book fetishists, design-heads, and font groupies who, like me, glory in the arcane knowledge that Bickford-Smith’s touching fable was printed in Italy on Munken Pure Rough. You won’t get that on a Kindle screen, that’s for sure. But if you’re looking for a gift for someone who has formed an unhealthily co-dependent relationship with their Kindle and yet is adulterously inclined to sneak physical books between the covers, you might want to invest in Smell of Bookstm an ‘aerosol e-book enhancer’. Compatible with most eReaders, it will swathe your beloved in the whiff of old library, without having all the time-consuming botheration of waiting for the chemical breakdown of cellulose and lignin in the paper, printing inks and binding glue. (Note of caution: another of the company’s perfumes is called ‘Eau, You Have Cats’). On the other hand, if you want the Full Monty, something, perhaps bound in Nigerian goatskin and printed on mould-made paper with deckle edges, might I direct you to the Folio Society? You may be tempted by their edition of the Fitzwilliam Book of Hours with its with silk-woven jacquard binding commissioned from a mill founded by an eighteenth-century Huguenot silk weaver. As physical books become more ‘collectable’, more like objets d’art than convenient delivery systems for textual (or visual) stuff, you cannot top Emily Dickinson’s ‘Envelope Poems’ published by Granary Books in 2012. 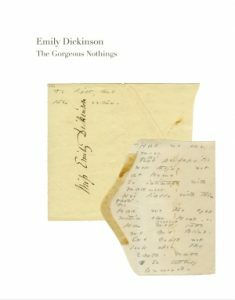 The Gorgeous Nothings takes its titles from one of Dickinson’s poems, a perfect blend of sumptuous physicality and the airily sublime. The book reproduces facsimiles of 52 poems written on flattened out envelopes by a poet who is practically a by-word for puritan economy and plainness and its opposite. These are fragments – even by the standards of that most fragmentary of poets – scrawled in pencil on throw-away scraps. Yet here they are, reincarnated as a sumptuously bound limited edition boxed volume accompanied by an essay, letterpress printed by Friedrich Kerksieck on Byron Weston Linen Ledger White and bound in Saint Armand Dark Linen with royal blue Shikibu Gampi-shi endpapers, no less. Yours for a mere $3500. So for anyone that’s listening, you know what’s at the top of my Christmas list for next year: put that in your Kindle and smoke it.